May 25, 1954: By todays standards a game lasting 2 minutes 54 seconds is the norm. Back in 1954 it took that long to comlplete a game where the Giants scored 21 runs pummeling the Pirates 21-4 at the Polo Grounds. The Tuesday afternoon matinee only had a crowd of 7000 plus on hand to see the Giants score the most runs they would in any game all year. Behind Johnny Antonelli's complete game seven hitter, his sixth victory in the 21 he would win on the season, the Giants scored 21 runs on 22 hits off fi ve different Pirates pitchers. Whitey Lockman led the charge with 4 hits and a grand slam HR to right field in the 7th inning off Joe Page. It was Lockmans 7th HR of the year and gave him 21 RBIs up to that point. 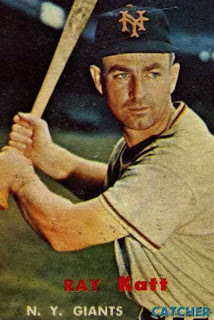 Second baseman Davey Williams hit a three run shot in the 8th inning and was one of four Giants to have three hits on the day. Weak hitting catcher Ray Katt was batting .314 at the time, he had 3 hits, including a double, triple & an intentional walk, driving in five runs. Young Willie Mays had 3 hits including a triple to drive in his 29th RBI, on his way to his MVP season. Out fielder Don Mueller who was on fire batting .370 at the time, also had 3 hits driving in two runs. Mueller would go on to lead the league with 212 hits that season. Even pitcher Johnny Antonelli hit a home run, his 1st of the year, on this day. Antonelli hit 2 HRs with 9 RBIs and a .163 average on the year. Leo Durocher's Giants were just starting to go on a roll, winning their 4th straight of a 6 game win streak, putting them 1 1/2 games out of 1st place. They would take over 1st place in two weeks, going on a tear winning 33 of their next 41 games. By July they would have a 4 game lead and never look back winning it all.